Prosurgics provides a range of robotic solutions to help improve patient outcomes and healthcare economics in hospitals around the world. It wanted to develop a second-generation robotic camera holder and asked Sagentia to lead the product development program. The result, FreeHand, is the first product on the market to bring affordable robotic assistance in minimally invasive abdominal surgery. Our client Prosurgics had carried out extensive international market research, revealing that many surgeons struggle increasingly to find dependable assistants to hold the camera during laparoscopic (key-hole) procedures. Even when quality assistance is available, surgery can be tiring, which can lead to camera shake, poor visualization and even longer procedures. Prosurgics wanted to develop its in-market first generation product, EndoAssist, into a second-generation robotic camera holder that would address these issues. The aim was to build on the successful functionality of EndoAssist and develop a product that was more compact, easier to set up and use, and substantially more affordable. In October 2007, Prosurgics appointed Sagentia as its key development partner, with a brief to take an existing prototype and ensure that stringent specification requirements for performance, safety, size, and ergonomics were all met. There was also a very ambitious timetable for the development. Sagentia became deeply involved in the product development program, including the management and co-ordination of Prosurgics’ other partners. We quickly assembled a team comprising mechanical, electronics and software engineers and work commenced immediately, Working prototypes were successfully developed by April 2008 – extremely rapid for a medical device. The result, FreeHand, is the first product on the market to bring affordable robotic assistance in minimally invasive abdominal surgery. Taking only moments to attach to the side of the operating table, the unit is controlled by the surgeon using gentle natural head movements, leaving the surgeon’s hands-free for instruments - a unique methodology being patented by Prosurgics. Benefits to the surgeon include optimal visualization and improved control over the procedure – it provides a completely steady picture which helps speed precise procedures, such as delicate suturing. It also means assistant surgeons can be used to their full potential. Additionally, how the surgery progresses is no longer dependant on the ability of the assistant surgeon to hold the camera steady for protracted periods. These benefits, in turn, convert into reduced procedure times and more efficient use of hospital resources. 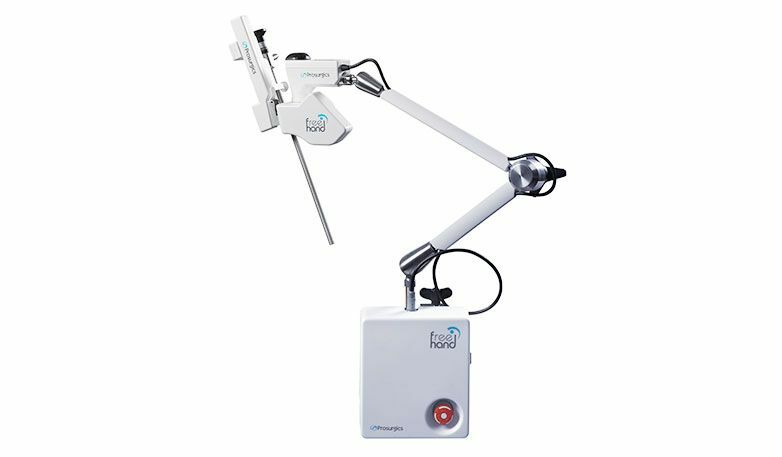 Since its launch in 2008, FreeHand has attracted significant interest from surgeons worldwide, and was recognized by the Society of Laparoendoscopic Surgeons in the USA as a ‘2008 Innovation of the Year’. Volume customer shipments will commence early in 2009. "Sagentia’s product development and project management skills have enabled us to leverage our IP and know-how in the most effective manner. The reduction in risk and faster time-to-market is critical for a company with the ambition of Prosurgics."